My review copy: I received a copy of Bold from the author in exchange for an honest review. When Sasha, a shy, 15-year-old girl who hides from the world, almost dies in a car crash, she vows that if she survives, she will be bold and live life to the fullest. Her newfound courage is tested when she meets Will, who moved to town after his journalist father’s disappearance. Will is fascinated by Sasha’s brush with and secret knowledge of death. Sasha and Will push each other to take chances and break out of their sheltered world. Will they discover the difference between being bold and being reckless before they put themselves, or someone else, in danger? There's this girl, the one with the scar. She's lucky everyone knows where her soft spot is. Mind, no one knows. So they poke at it all the time.. When most people feel something- good, bad, scary, happy-- they mean they're thinking about it. When I feel something, I really feel it in my bones. It has nothing to do with the accident, I've always been like this. I don't want to save you, okay, maybe I do. But it's more like, you know how people watch strangers and come up with stories about their lives? That always bugged me. I don't care about made-up stories, I want the truth. I try to get clues from who they are with or what they are wearing or carrying. I really wish I had tenth generation Google-vision glasses I could wear that would hold up some master computer somewhere and whoever I looked at, their vital statistics would download into my brain. You think I haven't noticed your little plan? Go out, life life, conquer your fear. If you had talked to me, I would have let you do more. It's only natural after what you've been through to go through stages like this. Fast Read. Sweet. Romantic. Enduring. 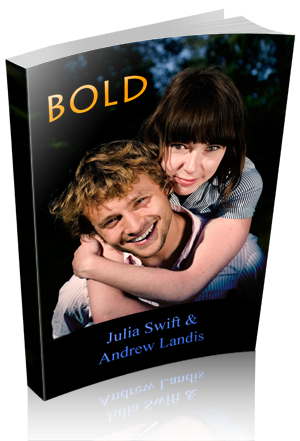 When I was contacted to do a review for Julia & Andrew of their new book "Bold" I had no idea I would be blown away by the concept of this book and the conscientious way this book is woven together. Two writers that are just starting out. Although they have script writing experience, this is their first full length book and I for one, just can't believe it! The writing style is captivating. The story is original. The characters are well thought out and flawed in all the right places. The language was beautiful and I found myself have to leave out certain quoted text that I highlighted because quite literally I could have quoted so many different sections. The prose flowed together so seamlessly. It was a joy as a reader to read such eloquent writing. Bold is the story of Will and Sasha. Both are dealing with their own secrets that they just don't want to share with others or each other for that matter. However, they are continually thrown together by chance, and by choice. The story is told from both characters point of view, which I absolutely love. It has always bothered me when I was reading a story about two main characters and the book is only told from one of these main characters frame of reference. If you are going to make two protagonists in a story, you should tell the story from both perspectives. Just my opinion of course. Sometimes contemporary stories have to force the characters together in order to make their point, but this book felt just the opposite for me. The characters developed slowly and found their way through out the story without the plot having to catch up at all. I can really relate to both these characters stories and how they have to find their way. Teens have a difficult job growing up and everyone's story is different. Trying to find the way is often difficult and heart wrenching and I think the story did a great job portraying these facts. I did not feel that either of these authors were writing their first novel, but could both be seasoned authors with many novels already published. A breath of fresh air, a quick read and recommended for those that love a great story that is well thought out and beautifully written. Julia is amazing at keeping other people's secrets but completely incapable of guarding her own. Every embarrassing moment ends up in her writing. While at film school at U.S.C., Julia met her writing partner, Andrew Landis, and realized having two writers makes it harder for people to identify the autobiographical elements from her crazy past, present... and fantasies. Over the last decade, Julia and Andrew have written for television, features, theater, game design and now, her ultimate dream, a novel. Raised in L.A., with summers in Las Vegas and college at Columbia University in N.Y.C, Julia now happily lives in the suburbs with her three great loves -- her husband, son and sweet, sad-faced rescue dog. Born in South Korea, Andrew spent his first seven months staring at other babies in an orphanage, wondering where everyone would end up, until he was adopted by an American couple. Raised by a minister and a teacher in rural PA, Andrew was never quite sure whether he stood out because he was a pastor's kid or because he didn't look like everyone else. After N.Y.U and four years of working on Capitol Hill, Andrew moved to L.A. He earned his M.F.A. in screenwriting from U.S.C., where he met Julia Swift. Together, they have written for dramas such as Smallville, The Book of Daniel and Hercules: The Legendary Journeys. Not surprisingly, the stories they tell often deal with families or sticking up for the underdog. Bold is their first novel. Andrew has completed 12 marathons and lives in L.A. with his husband and their dog.